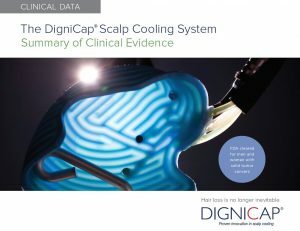 In 2015, after a rigorous review by the FDA, DigniCap was the first scalp cooling system to receive clearance in the United States. Summary It was concluded that the DigniCap Scalp Cooling System prevented hair loss in 66.3% of patients with breast cancer receiving adjuvant chemotherapy, compared to a control group where all patients experienced significant hair loss. Scalp cooling treatment was well-tolerated and no scalp metastases have been observed. For more information about the DigniCap Pivotal Trial CLICK HERE. For more information about research on solid tumors, CLICK HERE. For more information about scalp metastases, CLICK HERE. For more information about quality of life related to scalp cooling, CLICK HERE. For more information, download the DigniCap Summary of Clinical Evidence HERE.